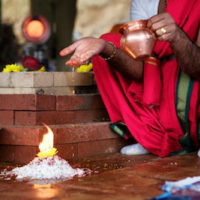 The couple who wants to celebrate their wedding according to Vedic tradition needs to purify their minds, hearts, bodies, and souls to continue their new marital life. The Vedic Wedding starts with the purification ceremony using mantras. Bride and bridegroom pray to the gods, including Surya, Varun, Brihaspathi, and Indra to remove every defect and make them fit for a harmonious and long married life, blessed with progeny, health, and happiness. Agni Dev, the fire god, is the main witness of the marriage ceremony because he is the symbol of knowledge, power, and purity. 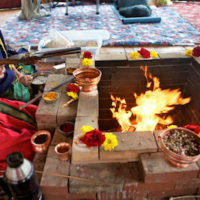 The couple gives offerings into the sacred fire to emphasize the couple’s joint responsibility to maintain the love and dignity of their union. They declare out loud that they have become one and will forever love each other and remain ultimately devoted for the remainder of their lives. 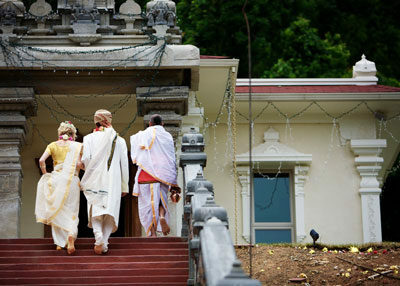 The Vedic Wedding demonstrates to the couple how to lead a happy life, while following Vedic tradition. They should love, cherish, and respect one another from their wedding day forward, for better or worse, for richer or poorer, in sickness or in health, and forever live together. Together they will create a home full of joy and laughter, where they can find serenity and strength. Together they will share a steadily deepening love which grows in understanding and consideration. In this Vedic Wedding, Pandit Prasad will chant mantras and give blessings to the couple for their good luck, prosperity and a long and happy married life together.